On an October morning, when the air and light was like a tonic, I sat in a museum of stilled machines and old filed papers, the only visitor. I sat at a desk between two clocks. A grandfather clock was behind me and an office regulator clock, with a large pendulum, was in front. The clocks ticked loudly; they ticked in unison. Clock-clock-clock. I could feel the pendulums swing in my gut. Everything else in the museum was mute — the Model A, the steam-engine pumper, the children’s toy metal cars. The clocks were insistent. Time was ticking through me. I have been to this small museum several times. Each time I am the only visitor and each time I am welcomed by an elderly volunteer happy for the company. On this visit, a woman, who had lost some portion of her sight, insisted on showing me around. She wanted to be of help, but when I asked her for the files in “Drawer E” she had no idea that they had a Drawer E, or where it might be, or even where to find the pencil sharpener. She went off to call someone who might know. I was alone with the clocks. Out the window I could see the electric current of October light. On my next visit, an elderly gentleman met me. He knew where Drawer E was, but before he took me to it, he insisted on telling me a long story, the story of his life. He began when his ancestors came to town in the 1880s from a neighboring town, and he took me through various summer jobs spent haying and roofing, followed by college (only the fourth person from his town to go,) then World War II (32 months in the Pacific without firing a shotâ€”he’d seen more action on the Fourth of July,) and home to a long career with one company in some kind of engineering and management. He fixed his gaze on me. The clocks ticked. Though I was anxious to finally read what was in Drawer E, I followed his story and asked questions. He was presenting me with another clock. We now had at least four clocks in the room: his clock (how-it-was, how-it-was), my clock (can-we-get-going?) and the two antiques clocking away. If he ever did bring me the files, there would be another clock in the room. Every historical event moves to its own time, and if you pay close attention you may catch its cadence—in a phrase in a letter, in the poise of the handwriting, or in the way one letter answers another. What we want from the past is presence. We want the moment restored. We want the October day that I could see out the window: A row of old maples shimmering yellow-gold. A blue sky. The sound now and then of children at recess, mobbing a soccer ball. This kind of two-sentence biography is common in local histories. These sentences swim by in schools, each sentence a lifetime of suffering and struggle. Mortality: Another clock ticking. Clock-clock-clock. The clocks were like a heartbeat, that’s why I found them so disturbing. We are all clocks. We are time, says Zen Master Dogen. “Time, just as it is, is being, and being is all time.” Jorge Luis Borges says, “Time is the substance I am made of. Time is a river which sweeps me along, but I am the river; it is a tiger which destroys me, but I am the tiger; it is a fire which consumes me, but I am the fire.” This is what I heard in the old clocks. It’s why I first began to think about this book. My previous books have searched for ways to see the deep time hidden in the common place. In the Memory House looked at the way we create our history. Each chapter explored how we choose our ancestors, choose who gets to enter the memory house—whose names are on the landscape, monuments, and holidays. The Same Ax, Twice pursued a living past, a past that gives us the vision to shape the future. I was searching for a past that wasn’t stop-time, wasn’t a frozen museum. My last book, The Bones of the Earth, looked at the way people still carry the allegiances to the oldest landmarks—sticks and stones. This is a book about time and place. They were once inseparable. Science historians note that before Thomas Edison, light and fire were the same thing; after Edison they were separate. The same can be said of time and place. Before the railroads created Standard Time zones in 1883, and international time zones were adopted the next year, time and place were one. After this, time was divorced from the rising of the sunâ€”off 4 minutes in one place, 18 or 36 minutes in another place. Time became a uniform commodity. Local time is “a relic of antiquity,” said the director of an astronomical observatory that sold time to subscribers, just as the utilities sold gas or water. Go down the long roster of 19th Century inventions, and you can check off the many inventions that wrested local time from its throneâ€”the railroad, the telegraph, the limited-liability corporation, to name just three. Timekeeping changed in two important ways in the late 19th and early 20th Centuriesâ€”clocks became more accurate and were linked to each other. Time reformers spoke of linking all clocks on earth to one master clock. But at the same moment, time escaped out the front door. There are many clocks, said Einstein in 1905. There is no time, but times, said his teacher, the physicist Hermann Minkowski in 1908. “Space and time are in the eye of the beholder. Each of us carries our own clock, our own monitor of the passage of time,” physicist Brian Greene writes in The Fabric of the Cosmos. This book is a look at some of the clocks we carry. I look at time in the invention of Continuous Vaudeville; in a once-common, now-vanished dry-goods shop; in an old mill family defending water-power rights; in a Broadway hit of the 1880s that is still performed annually on an outdoor stage; and in the lingering effects of a bloody war that one historian calls the first American Revolution, a war many Americans don’t even know happened. As in my other books, most of the stories come from the New Hampshire land in sight of Mount Monadnock. After twenty-five years, this place is still teaching me to see. This book’s title—Turn & Jump&38212;is taken from the pioneers who helped to build a national culture: variety and vaudeville actors. For their “turn” on stage they traveled long distances, spending days and nights on trains making the “jump.” Turn and jump. Slapstick and knockabout. The language has the feel of rough travel over badly maintained railroad track. Business travelers live this life today. Turn and jump: it’s the cadence of many lives. Each chapter moves to its own clock. In each essay we take the measure of a different time flow. “No single clock can in itself measure time. It is always necessary to compare at least two clock-like processes,” writes philosopher J. T. Fraser, in Time, The Familiar Stranger. I’m looking for levels of time, different clocks that I can set running and then compare, metaphors with which to unlock the ordinary. Turn & Jump explores the divorce of time and place, of timekeeping from the way we dwell in and tend the places we call home. Many years after I had sat between those two insistent clocks, I learned that my unease was one that folklorists had also noted. When people began to live with clocks in their homes, a body of popular belief and superstition grew up to domesticate the strangeness. It was considered bad luck to have two clocks ticking in the same room, or the same house. “My grandmother would not do that for anything, for she said it was sure death,” one folklorist was told. One clock in your house changed things, changed the way the day itself was lived, but two clocks (almost certain to disagree) could call into question the authority of this machine, or even mock God, the master clockmaker. Two clocks, sounding noon minutes apart, speak too plainly the truth that clocks are a fiction we accept in order to get on with our day. In the time between two noons in one living room, there is the space for doubt to enter. It allows the truth to come calling: we don’t know what time is, but we know that our allotment is limited. We domesticate time the best that we can. It’s why we do not understand the physicists when they throw out past-present-future, and why no matter how many times they explain that time slows down as you approach the speed of light, we walk away still married to a notion of absolute time, steady time, from Newton’s lips to God’s ears. It’s been a hundred years since Einstein began to shake things up, but still we live as if Newton had gotten in the last word on the apple falling from the tree. In our time-ignorance, we are adherents of the flat earth. But there is no one absolute time. We live in many times, with many clocks. We are ourselves many clocks — biological rhythms upon rhythms. Once I saw a great clock in an old family home. The family had lived for several generations in a grand Federal-style house built in 1821 on a New England common. They were one of those outstanding families, whose house, with its casual grace, makes you think they are on a first-name basis with time, and that while they haven’t cheated mortality, they’ve done some trick with mirrors and portraits and memoirs that has stretched timeâ€”as if one of their years is equal to seven of ours. The house had an elegant entrance, a central hall with a stairway spiraling up three stories. The cherry handrail was satin to the touch. In the entry stood an antique grandfather clock. The works were missing. The hands were missing. The inside of the clock, where the pendulum would have been, was filled with mittens and gloves, layers of red wool and black leather, of blue, white, and green, going back winters upon winters. It was like a geological deposit, like snowfall. There were children’s mittens deep in the pile that once belonged to boys and girls who were grandparents now. This is a measure of time we can understand. Tell us how many mittens it has been since then, how many gloves since the winter the blizzard shut everything down for days. This was a clock within a clock, with the minutes and hours silenced, and the generations ticking away. There is always more than one clock in the room. "Benjamin Franklin said time is money. 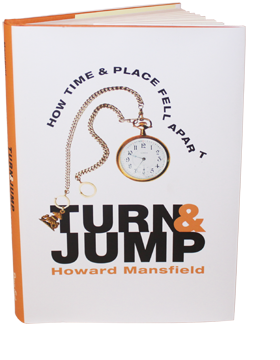 For Howard Mansfield, time is people… He does his turn on Ebeneezer Edwards, then jumps time and space to Denman Thompson or Marge Bruchac. The connections are what gives the book its power."